This new Weight Bearing Protective Cover has been designed to accommodate Digital (DR) Panels, CR Cassettes, and traditional X-Ray Cassettes. These covers are strong yet light-weight, offering a high degree of protection during weight bearing studies or procedures. 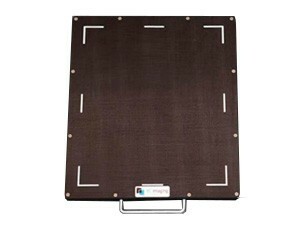 The latest panel and cassette protector is constructed of a high density polyethelene frame and a carbon fiber top, offering protection up to 1,200 lbs. Our easy lift handle makes removal and carrying a breeze. Each includes non-skid rubber feet that maintain the correct placement even on hard surfaces, which provides safety for all patients during procedures. The handle offers easy lifting and removal.